If I were to give you a butterfly quiz, I’m quite sure you could pass. Here we go. Which butterfly has drastically decreased in populations during the last decade? Unless you’ve had your head in the sand, you probably know about the decline of the monarch butterfly populations, as upwards of 90 percent. It’s true and sad. There have been speculations as to why, with suggestions of drought to deforestation in Mexico where the majority of Eastern monarchs over-winter. The science is now pointing to the lack of milkweed (Asclepias spp.) in their summer breeding ground. Milkweed is the only host plant of the monarch butterfly. Many of us believed this loss of milkweed in farms was part of the problem all along; now there is science to back it up. 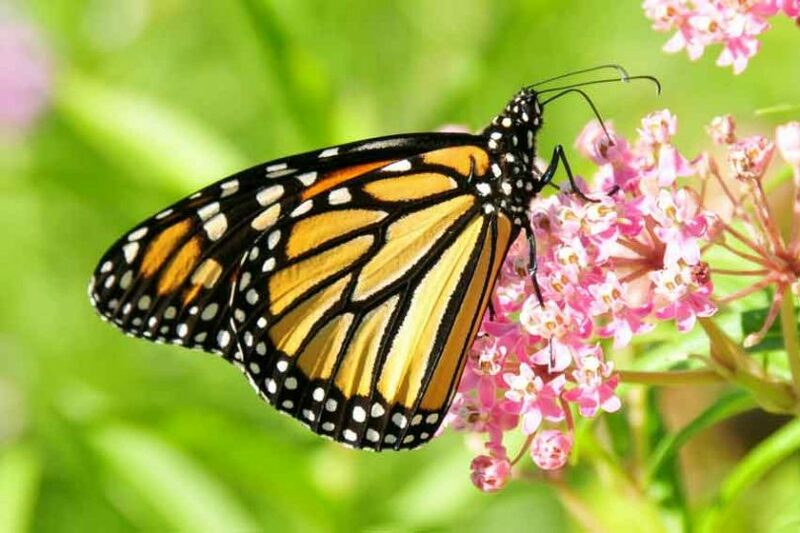 With more and more Roundup-ready acres to meet the demand of corn chips and ethanol in gasoline, for example, we are loosing even more milkweed. Roundup kills weeds, including milkweed, but not the main crop. The lifecycle of the monarch is straight forward: Egg—Larvae—Chrystalis—Adult. Their migration, though, is fascinating and a mystery. The butterfly that leaves Mexico in the spring will not return in the fall; rather, returning will be their great, great, great grandchildren. Monarchs leave Mexico in the spring to travel through the Corn Belt region, where there is massive agricultural land. In the Triangle area, depending on weather conditions, we might see monarchs migrating in the spring, but more often, we see monarchs from mid-August and later, as they are returning to their winter sites. We may see them earlier, if they got off course. Adult monarchs emerging in the late fall, and thus preparing for their migration south, are in reproductive diapause. Dia what? Diapause is the state of suspended development of the reproductive organs. These monarchs won’t mate or lay eggs until the following spring. While in a state of diapause, these migrating monarchs live up to nine months to make the return, whereas the first, second, and third generations lived only two to four weeks. Decreasing day length and temperatures, along with aging milkweed and nectar sources trigger a change in monarchs; this change signifies the beginning of the migratory generation. How they find their way back to their breeding grounds, both summer and winter, remains a mystery. Upon arrival to their winter sites, in the case of Eastern migrations, monarchs aggregate in oyamel fir trees on south-southwest facing mountain slopes in Mexico. These locations provide cool temperatures, water, and adequate shelter to protect the monarchs from predators and allow them to conserve enough energy to survive winter. Recently, there has been a controversy suggesting that tropical milkweed (Asclepias curassavica) is causing harm to the fall migrating monarchs returning south. The controversy of this non-native milkweed stems from its ability to winter-over in hardiness zones 9-11. More and more information finds the tropical milkweed that over-winters could cause harm to the monarch by delaying migration. In doing so, according to a study from University of Georgia, the evergreen nature of tropical milkweed may increase the rate at which monarchs are infected by the parasite Ophryocystis elektroscirrha (OE.) This research revealed the longer the monarch caterpillar remains a resident, the higher number of OE parasites found. So what does this mean to you? Since the majority of the Triangle is zone 7, tropical milkweed isn’t evergreen here. For our neighbors to the south who live in a more temperate zone 9 and higher where the tropical milkweed is an evergreen perennial, they may want to cut the plant to the ground by October, so the returning monarchs will continue on instead of staying put.